Artistic rendition of a 10MW OTEC plant. Ocean Thermal Energy Conversion (OTEC) is a process that can produce electricity by using the temperature difference between deep cold ocean water and warm tropical surface waters. OTEC plants pump large quantities of deep cold seawater and surface seawater to run a power cycle and produce electricity. OTEC is firm power (24/7), a clean energy source, environmentally sustainable and capable of providing massive levels of energy. Recently, higher electricity costs, increased concerns for global warming, and a political commitment to energy security have made initial OTEC commercialization economically attractive in tropical island communities where a high percentage of electricity production is oil based. Even within the US, this island market is very large; globally it is many times larger. As OTEC technology matures, it should become economically attractive in the southeast US. Makai has been pioneering OTEC research since working on the first net-power producing plant in 1979. Since that time, Makai has been a sub- or prime contractor for dozens of unique research and development contracts in OTEC. 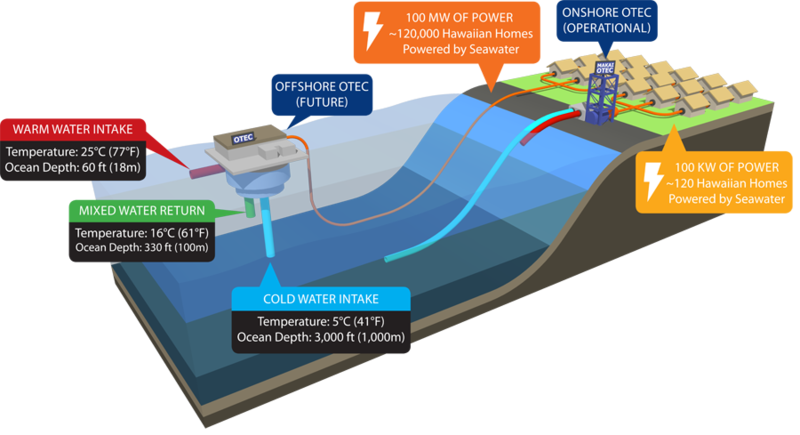 Most recently, Makai has been involved with Lockheed Martin and others pursuing the development of 100MW OTEC plants for island communities like Hawaii and Guam. Click here to learn more about our OTEC grid-connection ceremony. 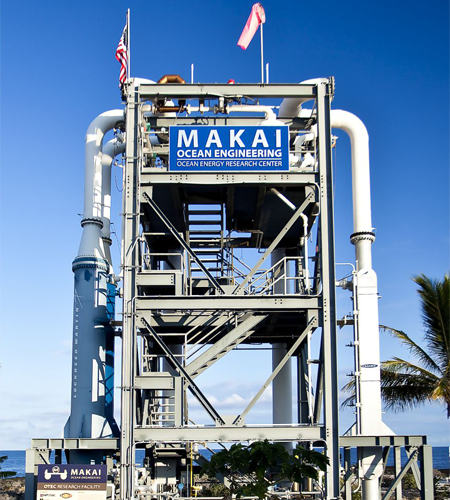 Makai has developed internationally recognized expertise in OTEC in the areas of commercial and pilot plant designs, overall technical and economic modeling, heat exchanger design and testing, cold water pipe design and deployment, environmental effects (hydro- and bio-plume modeling), and the power cable to shore. Why does the U.S. have this Ocean Energy Research Center? the OERC’s land-based OTEC power plant, supplying closed-cycle OTEC power to the grid for the first time in U.S. history starting late summer 2015. Pipelines: Ongoing cold water pipe research and design. Pilot Plant: Designs for the first offshore OTEC pilot plant in the range of 2 – 10MW net-power. Environmental Effects: Multiple discharge water hydro- and bio-plume studies. What is being done at the OERC? A basic closed-cycle OTEC plant is shown in the figure above. Warm seawater passes through an evaporator and vaporizes the working fluid, ammonia. The ammonia vapor passes through a turbine which turns a generator making electricity.  The lower pressure vapor leaves the turbine and condenses in the condenser connected to a flow of deep cold seawater. The liquid ammonia leaves the condenser and is pumped to the evaporator to repeat the cycle. The Ocean Energy Research Center (OERC) is an essential tool for the development and testing of candidate OTEC heat exchangers. Heat Exchangers will be the single most expensive component in a commercial offshore OTEC plant and thus optimizing their cost, longevity and performance are critical for OTEC’s economic success. The operating conditions of OTEC heat exchangers are unique, and an optimal design has yet to be developed. 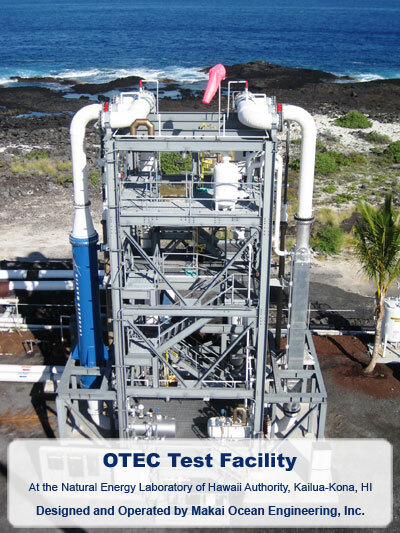 The OERC enables OTEC engineers to rapidly design, build, and test OTEC heat exchangers on an operational land-based OTEC plant, providing the feedback that is necessary for optimization. Makai uses a unique OTEC plant analysis software to design heat exchangers which accounts for lifespan, performance (heat transfer and pumping efficiencies), and cost (fabrication and effect on platform), to enable true optimization. Makai is in the process of scaling up a design for a low-cost, compact, corrosion-resistant design that could revolutionize OTEC heat exchangers. In addition, Makai provides objective performance testing services to other OTEC engineering firms for multiple heat exchangers simultaneously. What is the future of the OERC? Makai’s Ocean Energy Research Center will continue to serve as the premier testbed for OTEC technology and a platform for collaboration with the international OTEC community. Makai is an engineering services provider, and thus we work with multiple OTEC project developers to provide objective technical guidance at all levels, from engineering and economic feasibility to component design. Finally, the operation of a landbased OTEC plant by Makai will provide invaluable knowledge and expertise for the next step in OTEC commercialization: the construction of a large-scale pilot plant. Immense Resource: OTEC is solar power, using the oceans as a thermal storage system for 24-hour production. Unlike other renewable energies, the maximum available energy from OTEC is not limited by land, shorelines, water, environmental impact, human impact, etc. Baseload Power: OTEC produces electricity continuously, 24 hours a day throughout the entire year. Intermittent renewable energy sources are not baseload and often require storage of their energy during peak production hours for later consumption. Large, baseload OTEC plants could actually start to replace fossil-fuel-fired power plants without compromising grid stability. Dispatchable Power: OTEC is dispatchable, meaning that its power can be ramped up and down quickly (in a matter of seconds) to compensate for fluctuating power demand or supply from intermittent renewables. For this reason, OTEC is complementary to other renewables like solar and wind, and could enable further penetration on the grid while helping to maintain its stability. Security: OTEC offers the opportunity of tapping an immense energy resource that is not controlled by other nations. Renewable: OTEC is conservatively believed to be sustainable at four or more times man’s current total electrical energy production. Clean Energy: OTEC has the potential of being a very clean alternative energy – unique for a firm power source capable of providing massive energy needs. The environmental risk with OTEC is very low. Offshore: OTEC production occurs offshore. Land resources are not needed other than for on-shore landing. OTEC is not competing for other vital resources such as food and fresh water. The problem with this remarkable renewable energy is cost. At present, OTEC plants can be built that will be economically attractive to Hawaii, Puerto Rico and Guam (at electrical rates just above twenty cents per kWh range without energy credits). Makai Ocean Engineering performed a study for Office of Naval Research looking at an offshore OTEC industry providing energy to the continental US via ammonia as an energy carrier. These future OTEC prices are slightly high, but close to competing with other renewables and with overlapping margins of error. The winners: Island communities, U. S. Department of Defense (who have been strong supporters of OTEC and want smaller OTEC plants for base locations), and the U.S. Public. A mature and well developed OTEC industry (which will exist after building dozens of OTEC plants just to provide the US tropical islands) is a tremendous backup technology, as the US is backing into an energy corner and becomes more dependent upon nuclear and clean coal to fulfill our non-oil needs. Those technologies come with enormous environmental risk. Biomass, Wind and Solar can in some instances provide lower cost energy, but these are limited in the total quantity of energy delivered. Having OTEC as a viable and cost competitive alternative would be a very healthy position for the US. Since 2008, increased energy prices, environmental concerns, and new Department of the Navy energy policy led to government and commercial support to improve key OTEC technologies. Concurrently, Makai Ocean Engineering and Lockheed Martin rekindled their earlier OTEC support from the 1970’s, and directed internal R&D resources to create an OTEC technology development team. Lockheed invented a unique fiberglass cold water pipe fabrication technology, which led to a cooperatively funded Department of Energy project. Naval Facilities Engineering Command (NAVFAC) conducted a competitive bid during 2009 for companies to develop OTEC plant designs intended for tropical naval bases. Makai and Lockheed Martin won this project and have been refining designs to meet NAVFAC requirements. The Office of Naval Research (ONR) and NAVFAC have jointly funded construction of a new OTEC Heat Exchanger Test Facility. Makai Ocean Engineering is the designer and contractor for this facility, and will conduct performance and corrosion testing of several heat exchanger designs being built by several different firms. This effort is also being supported by the State of Hawaii. Ben Markus from Hawaii Public Radio publishes story “Ocean Power Gains New Life” regarding OTEC R&D of Makai and Lockheed Martin. Makai installed advanced manufacturing equipment to be used to produce marine-grade heat exchangers at our Ocean Energy Research Center. Installation required removing part of the roof! In late 2016, Makai completed the installation of sophisticated advanced manufacturing equipment for the rapid prototyping and manufacture of marine-grade heat exchangers at our Ocean Energy Research Center on the Natural Energy Lab of Hawaii Authority (NELHA) campus. This project was made possible by grants from the Office of Naval Research (ONR) in partnership with University of Hawaii’s Hawaii Natural Energy Institute (UH-HNEI), with matching funds from the High Technology Development Corporation’s Manufacturing Assistance Program (MAP). shipboard cooling – especially for the U.S. Navy. With an increasingly electrified population and concerns about energy efficiency and carbon footprint increasing worldwide, industrial and military users are looking for ways to make more efficient use of their thermal energy resources. Makai’s new heat exchangers are being developed to address these demands. Makai has a long and intense involvement with OTEC. 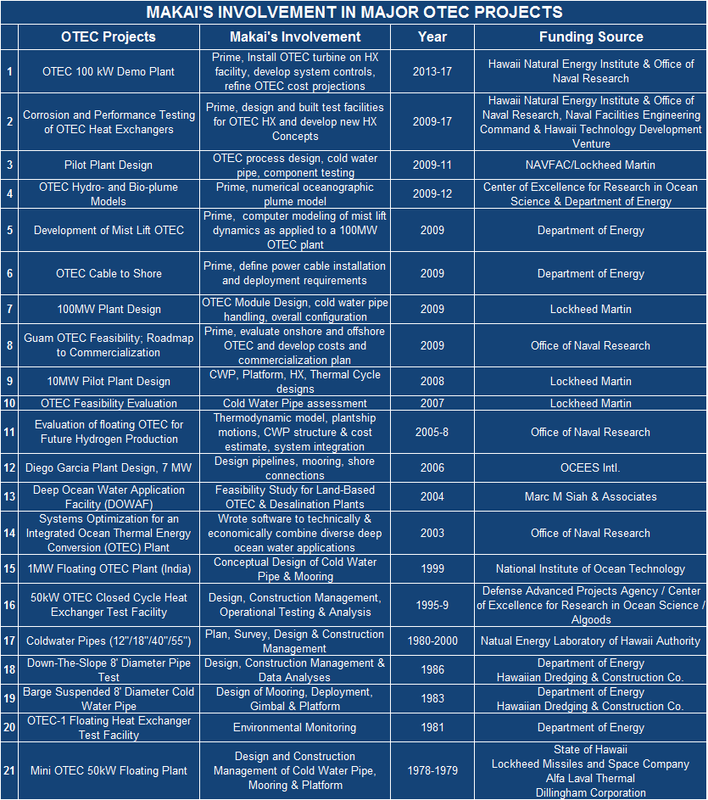 The table below shows OTEC projects spanning 30 years dating back to the first net power producing OTEC plant in 1979 with Lockheed Martin and the State of Hawaii. Most recently, Makai has been deeply involved with Lockheed Martin and the US Navy in focusing on the commercial development of 100MW OTEC plants for island communities like Hawaii and Guam. We have significant programs in heat exchanger design and testing, plume modeling, power module design, plant layout, cold water pipe handling and deployment, a pilot plant design, analyzing the power cable to shore, and bioplume modeling. Much of the recent work at Makai has been leveraged from our OTEC SBIR study performed for ONR and managed by NAVFAC from 2005-2008 (project #10 in the table above) which recognized the potential of OTEC in today’s energy market and climate crisis. That study developed a detailed evaluation of short term floating OTEC plants providing electricity to shore and a long term OTEC industry manufacturing an energy carrier for the continental US. Initial Plant designs and analytical tools were developed that are major design tools being used today in OTEC planning. A development Road Map was created that is now being implemented. The subsequent projects, items 1-9, have been a direct consequence of this earlier SBIR work. Today, there is a healthy and growing OTEC program moving forward in the US. In May 2010, Makai received from the Small Business Administration the Region IX Contractor of the Year Award in 2010 for our work on this OTEC project and leveraging it into the significant OTEC program that is underway today. During the course of this ONR SBIR work, Makai realized we needed a major partner in this development and we approached Lockheed Martin (we formerly worked together on Mini OTEC in 1979). We were thus able to leverage our enthusiasm, OTEC experience and analytical tools by aligning ourselves with Lockheed Martin Corporation. In this teaming arrangement we have focused on a practical and near-term approach to develop the world’s first major commercial OTEC plant at 100MW. A smaller pilot plant is shown in the figure above. 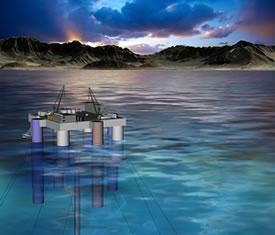 A 100 MW floating OTEC plant was designed for the NAVFAC study. In an offshore floating OTEC plant, deep, cold seawater is drawn through a vertical fiberglass pipeline from a depth of 1000 meters (3300 feet). This Cold Water Pipeline would have a 10 meter (33 foot) diameter, and its weight in water would be over 2.1 million kilograms (2300 tons). This pipe is unprecedented in the offshore industry and Lockheed Martin has developed a method of fabricating this fiberglass pipe while on a floating OTEC platform at sea. A major engineering challenge, however, is how to safely lower this large, flexible and delicate pipeline down into the ocean as it is fabricated section by section on the deck of the platform. 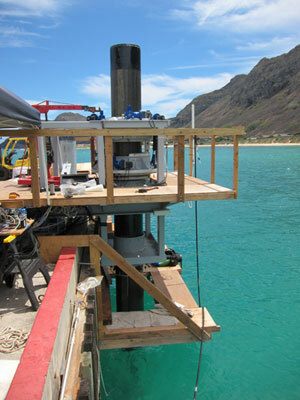 Makai has designed a system to accomplish this task, and a 1/20th scale model has been built and tested at the Makai Research Pier. The apparatus consists of two “Grippers”, so named because of the way they support the weight of the pipe by gripping onto the exterior of the pipe. These Grippers squeeze on the exterior of the pipe from all sides, and hold the vertical weight of the pipeline through Kevlar reinforced rubber pads using friction. The two Grippers are identical in structure except that the bottom Gripper moves up and down using hydraulic cylinders and the top Gripper is fixed to the platform. The Grippers lower the pipeline by a handover sequence where the Grippers transfer the weight back and forth; only one Gripper must be squeezed on the pipe at all times. Major concerns considered in the design include crushing the pipe and dropping the pipe. All these concerns were solved with the design developed by Makai. Rigorous testing of this model showed that the Grippers can reliably support and lower the pipe (and even hold the pipe without power!) and Grippers have been designed for both 10 MW and 100 MW OTEC plants based on these lessons learned. 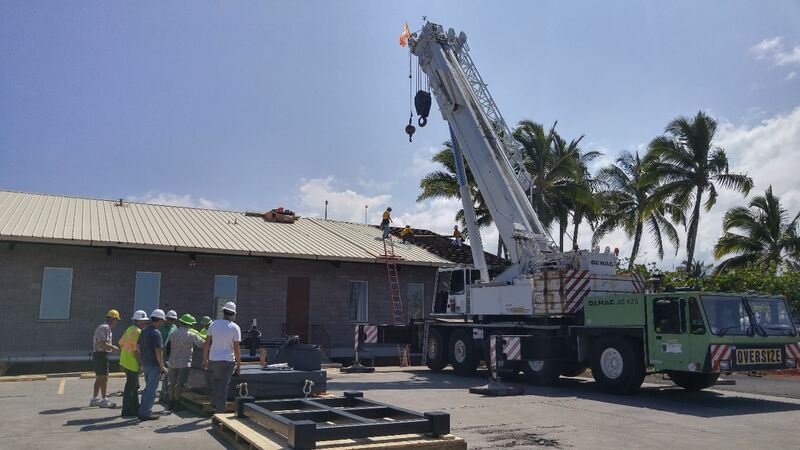 A test facility has been built at the Natural Energy Laboratory of Hawaii (NELHA), on the Big Island of Hawaii. NELHA is a state-owned business technology park that provides warm and cold seawater to their tenants. The deep seawater is obtained via a 620-meter-deep 40″ intake pipeline, or a 914 meters deep 55″ pipeline. NELHA can furnish a total of 26,000 gpm cold seawater, with corresponding warm water flows. No other facility worldwide can provide such large flows of deep seawater. The heat exchanger test facility is a 40′-tall tower that supports up to three different evaporators, three different condensers, 24″ seawater piping, and an accurately instrumented ammonia working fluid piping system with two pumps and pressure vessels. The test facility allows Makai to measure the performance of evaporators and condensers, as a function of water velocity, temperature difference, and ammonia flow rate. The figure to the right shows the facility under construction in mid-October 2010, portions of these systems are visible. NAVFAC and ONR sponsored the facility because it is more cost-effective to test the performance of heat exchangers on land, rather than incurring the high incidental costs of installing them into a floating vessel with its mooring system. Properly conceived “small” scale testing can be performed because OTEC heat exchangers are modular components. For example, a prototype heat exchanger at the facility will have slightly less than one square meter in cross section, have a height ranging from 2 – 8 meters tall, and will require a typical design seawater flow of 0.25 m3/sec (4000 gpm). The facility will allow us to carefully confirm a heat exchanger’s predicted performance, validating later design work for much larger facilities. Makai recently developed a numerical hydrodynamic model to assess the physical impacts of OTEC discharges in the ocean environment with funding from the National Defense Center of Excellence for Research in Ocean Sciences. Considering that no OTEC plants have been constructed, it is uncertain how the nearby ocean environment will be affected by the discharge of the nutrient rich deep ocean water. The project’s goal was to create a toolset to use for sustainable design of OTEC plants, which for a 100MW plant would require 720 m3/s of cold nutrient rich seawater and 420 m3/s of warm surface waters. The 3D-hydrodynamic model is based on the EPA-approved Environmental Fluid Dynamics Code (EFDC), and is customized to accurately generate the regional flow fields and density fields supplied by University of Hawaii’s data assimilative Regional Ocean Modeling System (ROMS). OTEC plants were “inserted” into the domain using a dynamically coupled finite-element jet-plume model, which simulates the entrainment and turbulent mixing of large scale plumes. The successful development of the model provides the tools needed to predict the impact of OTEC plants in the presence of realistic and time-varying ocean conditions. Results of the effort were presented at NOAA’s OTEC Environmental workshop in June, 2010, and the Department of Energy has funded an extension of the project (under the Marine Hydrokinetics Initiative) to develop a biological component of the model in order to assess any bio-stimulation that may occur due to the nutrient rich discharges. Ocean Thermal Energy Conversion (OTEC) uses large flows of warm surface seawater and cold deep seawater to generate clean electricity. The tropical ocean at a typical OTEC site has two distinct layers: a warm surface layer with low nutrient levels, and a cold deep layer that is nutrient-rich. Introducing deep nutrients into the ocean’s sun-lit upper layers could potentially increase plankton growth or cause algal blooms. Thus, seawater discharged from an OTEC plant should be returned into the ocean deep enough so that these nutrients don’t trigger biological growth. The U.S. Department of Energy has released a report describing the simulated biological impact from operating large OTEC plants. The study was performed by Makai Ocean Engineering under a cost-shared grant and can be downloaded here. This report has been peer reviewed by DoE Peer Review for Marine & Hydrokinetic Energy Devices on pages xii and 167 here. This new software is the most sophisticated tool for modeling OTEC’s environmental effects to date. When run with an OTEC plant, the model can determine the size, depth, and flows of the OTEC plant’s seawater discharges that would minimize plankton increases. In all cases modeled in Hawaiian waters, no increase in plankton levels occurred in the upper 40 meters (130 ft) of the ocean. From 40 to 120 meters (130 – 400 ft) OTEC-induced plankton growth is low and well within the naturally occurring variability. These results suggest that suitably designed large OTEC plants will cause no significant increase in biological growth. This model will be important to developers and regulators as commercial OTEC develops.